There is this thing called due process, where someone accused of something has a right to defend himself, except liberals don’t like it very much. They sometimes play lip service to it, but only when it has to do with covering for the criminals they consider victims of society. You Normals are “society,” by the way. But regardless, when it is politically useful to let super-convenient accusers trash people from a distance by feeding talking points to eager media allies, forget due process. Allowing someone to effectively challenge fake charges gets in the way of the liberal elite’s ability to slander good people for cheap political gain with fake charges. We can’t have that. The sliming of Brett Kavanaugh by a Bernie donor is disgusting and disgraceful, and if Democrats had any shred of decency they would hang their heads in shame and spend the next two months ahead of the midterms doing penance to atone for their scummy act of cheap political theater. But they don’t, so they won't. That’s why I hope that after he is confirmed, Justice Kavanaugh remembers and spends the next 35 years making the liberals sorry they ever pulled these skeevy shenanigans. Let's review. As I write this, a liberal who doesn't have the moral courage to subject herself to cross-examination is presuming to besmirch the integrity of someone who has never had his integrity questioned in any serious way. Well, it has been besmirched in an unserious way, by T-Bone’s buddy Spartacus as well as by that idiot Kamala Harris, but they didn't lay a finger on him because the dumbnamic duo’s allegations were such transparent baloney. But now we need to pause the confirmation so we can further investigate her inconsistent claim (Was it four dudes? Two?) that an ancient relic/senator sat on for three months? Or something. Sounds legit. Whatev. Victim status, whether based upon truth or lies – because people do lie, and all the time – does not give you any special privileges or special rights. Instead, it gives you duties and obligations, whether that is cosmically fair or not. See, if you propose to inflict damage upon someone, even if justifiable, you bear the burden of proof. You have to prove it; the accused doesn’t have to disprove your amorphous innuendos. You have the duty to back up your claims, in public, and subject yourself to the greatest engine for the ascertainment of truth humanity has yet invented, cross-examination by a zealous advocate for the accused who is doing his best to show that you can’t be trusted. Take the stand and the heat, or shut up. Is it hard? Yeah? Is it tough on real victims? It sure is. Is it unfair? Maybe, but the only people who think life can ever be fair are little kids and socialists, and only fools design their society around the insights of either bunch. Maybe some tough cross-examination of Asia Argento back when she was a #MeToo heroine might have prevented the activists from going all in on someone who now seems to belong squarely in the abuser column. People who tell you that “You have to believe the victim!” are afraid you’ll spoil their lynching if you discover the alleged victim is lying. When people refuse to allow the one thing that centuries of experience has shown to be the best way to discover the truth, due process including the cross-examination of the accuser, then it’s reasonable to assume that they are not interested in the truth. Is she hiding from examination because she’s afraid that people will challenge her claims and maybe find exculpatory evidence? This mystery woman appears to admit to mental health issues, which allegedly stem from this ambiguous, third of a century-old alleged encounter, but who knows? We don’t know, but if you really wanted to know the truth, wouldn’t you want to? Her claims must be challenged if we intend to keep pretending we are seeking justice. Let's be clear. It is a good thing, a necessary thing, a critical thing, to allow a tough advocate for the accused to forcefully challenge anyone making a devastating accusation against someone else by forcing them to prove their claim. No one has the right to expect people to go easy on them when they are saying something that can have such a dramatic effect on another person’s reputation and life. It's not pleasant, but it is absolutely necessary if we are going to figure out the truth. I know. I do it for a living as a trial lawyer. I intentionally, and on purpose, ask hard questions of people claiming to be victims of various wrongs that are designed to elicit a response that demonstrates to my juries that the person on the stand is not telling the truth. And the other side gets to do the same of the people I represent. That’s a good thing. It all seems so convenient that California’s doddering, crusty senator (remarkably, DiFi is the least stupid of California's two senators, and she's astonishingly stupid) decided to announce this claim in such a manner that Kavanaugh has no way to defend himself. 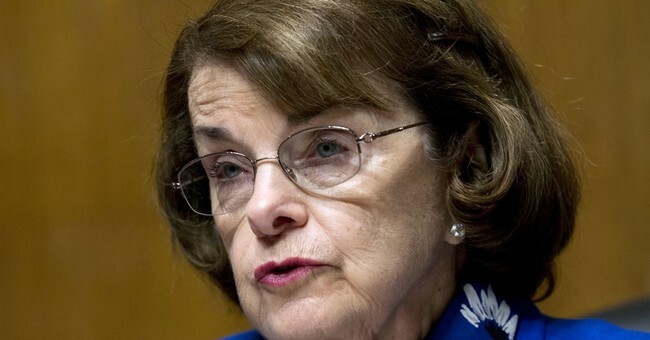 Maybe the red Chinese spy Feinstein had on staff for 20 years gave her some pointers. As my upcoming book Militant Normals: How Regular Americans Are Rebelling Against the Elite to Reclaim Our Democracyexplains, we are in a conflict between an elite that is threatened by the outraged mass of normal Americans who elected Donald Trump in response to the elite’s long track record failure. The elite’s push-back demonstrates that Normals have accurately assessed that the rules the elite points to are only meant to apply to the Normals. The elite may talk a good game about the rules and norms and stuff, but it does not consider itself bound by them. So, this kind of accusation is fine. Innuendo is fine. Slander is fine. They have to preserve their power and position, you know. And that imperative transcends your bourgeoise morality. Keith Ellison, Bill Clinton and Ted Kennedy were all unavailable for comment. But do you think Normals are just going to stand there and accept that the rules are applied only to them, while the very people charged with preserving and enforcing those rules blithely ignore them? Do they really think that a double standard society is possible and stable over the long term? It’s not – check out my novels about what happens to America at the bottom of that slippery slope. Luckily, the Republicans are getting woke to the okey-done, and recognize this as a Hail Satan play by Democrats who realize that the Brett Kavanaugh Express is rolling toward the confirmation station. Heck, even some of the Fredocon sissies are upset by their liberal elite pals and are taking the side of Normals for once, so you know it’s undeniably outrageous. Brett Kavanaugh is going to be confirmed. And when he is a justice on the Supreme Court, I hope he remembers what these people did to him. I hope he gives them the same kind of lesson in the power of payback that Clarence Thomas has delivered for nearly three decades. As Militant Normals observes, pain is a great teacher, and the elite needs to learn.